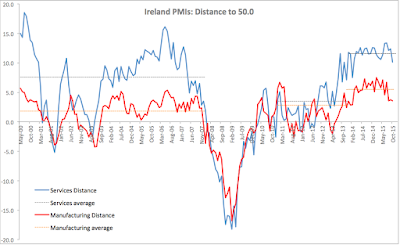 Irish manufacturing and services PMIs have been released by Markit, covering October. On Manufacturing PMI side, there has been some improvement in growth conditions in the manufacturing sector, with faster growth in new business, offset by softer production growth. 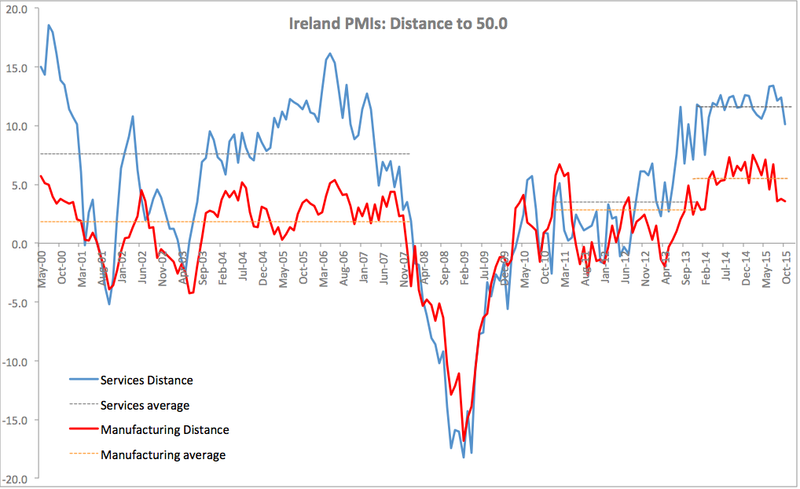 IrishManufacturing PMI posted a reading of 53.6 in October, down marginally on 53.8 in September. Per Markit: “Business conditions have now strengthened in each of the past 29 months. The rate of expansion in manufacturing production continued to ease in October, the third successive month in which a slowdown has been recorded. The latest rise was the weakest since February 2014, but higher sales, in a number of cases from export markets, supported continued output growth.” In other words, MNCs activity is once again the suspect key driver for continued growth in the sector, not that Markit would say so outright. On a 3mo average basis, 3mo average for the period through October stood at 56.1 - a hefty rise on the 3mo average through July 2015 that registered 53.7 and almost in line with 56.5 3mo average through October 2014. Over the last 6 months through October, the index average was down 1.5 points on the 6mo average through April 2015. Meanwhile, on Services PMI side, October marked another month of rapid growth, although the rate of growth eased somewhat from dizzying highs of September. October Services PMI stood at a hefty 60.1, down on jaw-breaking 62.4 reading in September 2015. On a 3mo average basis, 3mo average through October 2015 was 62.7, up on 3mo average through July 2015 (61.5) and above the 3mo average through October 2014 (61.2). Per Markit: “Although [October reading] signalled the weakest expansion in activity since February 2014, the rate of growth remained elevated as higher new business continued to lead to rising output. 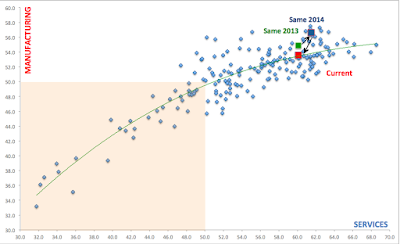 As chart above shows, both services and manufacturing sectors continue to perform well ahead of historical comparatives, but on-trend in terms of growth balancing between two sectors. “Excess’ growth in Manufacturing, evident in October 2013 and 2014 data has eased, while accompanying moderation in growth in Services was somewhat weaker. Again, all indications are - exporting sectors are driving growth, dominated by MNCs, though domestic internal demand is also supporting expansion.